Are you still worrying for your car for not having a garage? Are you still complaining about the company vehicle standing in the open for a long time without cover? Are you still upset about hard to find place to park you vehicle while you are traveling by car? Come here! Liri Tent have all the solutions for you. 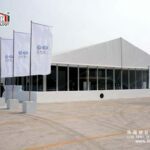 Before choosing a carport tent, the safety, practicability, durability and aesthetics of the tent should always come into consideration first. Liri has adopt the most advanced CNC machining system in China, only a few German and USA companies can do the same. 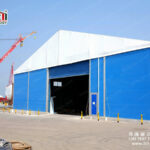 The boss of Liri is the one who start aluminium structure tent manufacturing industry in China and our company has been identified by the whole world and won great reputation, so is our aluminium structure tents.What is more, we have certificates for our aluminium structure and flame retardant PVC fabric. 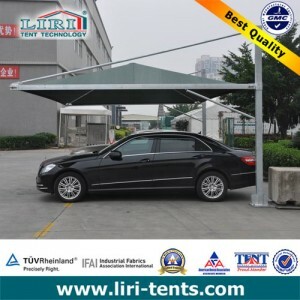 We have both single and double wing carport tents in different sizes for not only one car, but also two or more, enough for your whole car family. Modular system design makes the tent easy to assemble and dismantle. Flexible fixing solutions enables you to remove the tent whenever you need. The “Sweet Home” can goes together with your cars. Our carport tent use high quality aluminium profile which can last for about 20 years. And the fabric has long life span–about 6 to 8 years. 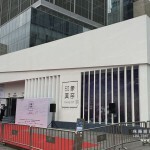 And various choices of roof material and color are available. 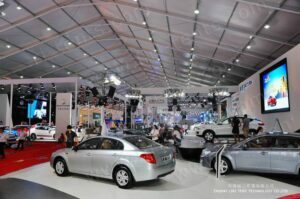 You can design a perfect and warm “home” for your car. 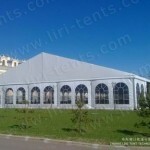 Which Tent Style Is Best For You?